Rolf Harding, was born in Hamburg, Germany in 1922. 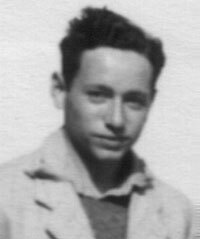 The son of a Jewish father and non-Jewish mother, Rolf Harding (then Heudenfeld) grew up in Nazi Germany from where, in great danger that was heightened after 'Kristallnacht' (the night of broken glass, 9 November 1938), he escaped on the Kindertransport and settled in England. Some of his family were murdered in the Nazi concentration camps whilst others managed to evade capture and survive the war. 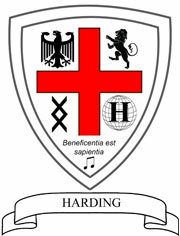 You can read the graphic account, by his son Phil, of Rolf Harding's early childhood, persecution, escape from Germany at age 16 in February 1939, arrest in England for internment when war broke out, expulsion on board the SS Sobieski to Canada for screening in a Prisoner of War (PoW) camp, and return to settle in wartime England. - an account of Rolf Harding's childhood and escape from Nazi Germany by his son Phil Harding, MBE. Note. A printed copy is held by the Wiener Library. I would like to leave you with a few verses from Psalm 62 verses 5-8. Yes, my soul, find rest in God, my hope comes from Him. Truly He is my rock and my salvation; He is my fortress, I shall not be shaken. My salvation and my honour depend on God; He is my mighty rock, my refuge. Trust in Him at all times, you people; pour out your hearts to him, for God is our refuge. A tribute to Rolf Harding by his son Phil for Rolf's funeral can be found on the Coopersale Vicarage page of this website. You can download here a small booklet issued by The German Jewish Aid Committee in conjunction with the Jewish Board of Deputies in c.1939 and given to refugee children arriving in England. It is reasonable to assume Rolf Harding (then Heudenfeld) was issued with such a booklet - this booklet was obtained after he had passed away but the good manners and politeness it seeks to encourage was typical of Rolf Harding's approach to other people throughout his long life. Page 12: "Do not criticise any Government regulation, nor the way things are done over here. Do not speak of "how much better this or that is done in Germany". It may be true in some matters, but it weighs as nothing against the sympathy and freedom and liberty of England which are now given to you. Never forget that point." Page 12: "The Englishman... values good manners far more that he values the evidence of wealth. (You will find that he says "Thank you" for the slightest service - even for a penny bus ticket for which he has paid.)" Page 14: "Try to observe and follows the manners and customs and habits of this country, in social and business relations." Page 16: "Be loyal to England, your host." 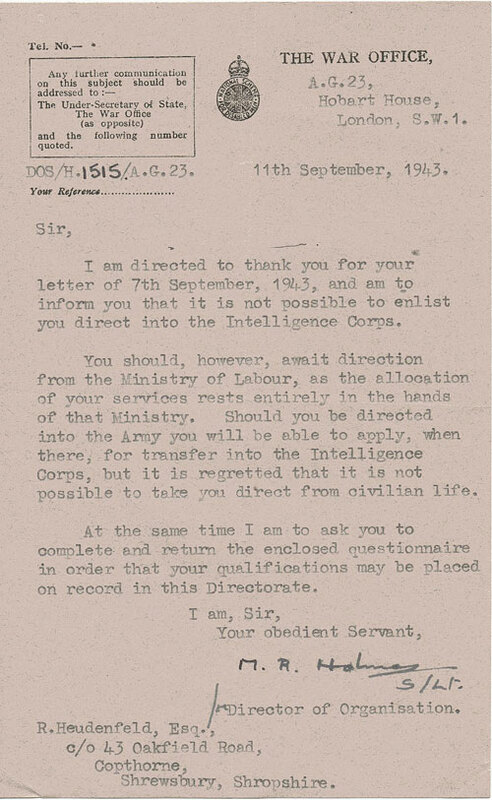 Below is the letter dated 11th September 1943 from the War Office to Rolf Heudenfeld advising him that his services were not required in response to his application to join the Intelligence Corps and use his fluency in German and English along with his knowledge of Germany to support the allies in the war effort to defeat Nazi Germany. Photographs of Rolf and Elizabeth and their family can also be found on the Coopersale Vicarage page of this website. Rolf entered theological training at Oakhill Theological College, Southgate, North London, but the college was closed due to the war. For his war effort, having had his offer to spy for Britain turned down, Rolf held a teaching post at Prestfield Prep School in Shrewsbury where he was a Form Master and taught Latin, History and PE. 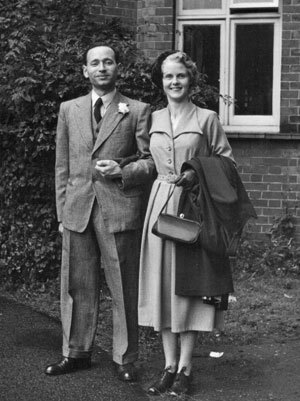 Rolf then left Shrewsbury and taught at St Michael's Church Missionary Society School, Lympsfield, where he met his future wife, a pupil there, Elizabeth Ashton (they married in 1951). 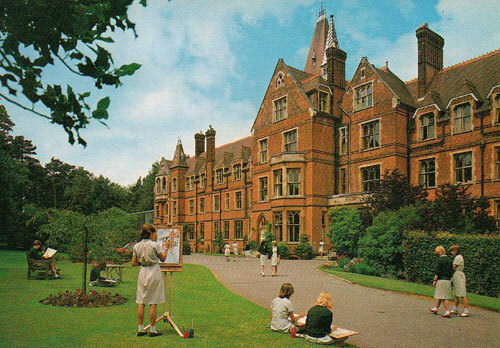 20th Century postcard of St Michael's School, Limpsfield. 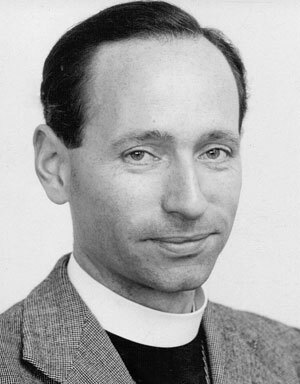 Rolf completed his theological training at St John's College, Highbury, in North London (since renamed the London College of Divinity) and entered full-time Ministry with the Church of England. His first posting was to establish a new church in Harold Hill, Romford, Essex. In 1952 Rolf named the newly built church St Paul's. In 1961 Rolf became the vicar of Coopersale, Epping, Essex, until he retired to Weston, Bath, in 1991, aged 69. During his time at Coopersale he was appointed hospital chaplain at St Margaret's Hospital, Epping. 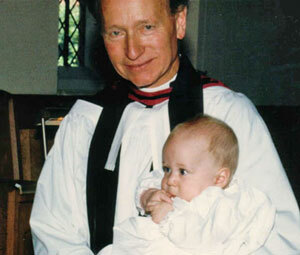 On retirement in 1991 he continued with hospital chaplaincy work for several years at the Royal United Hospital, Bath. 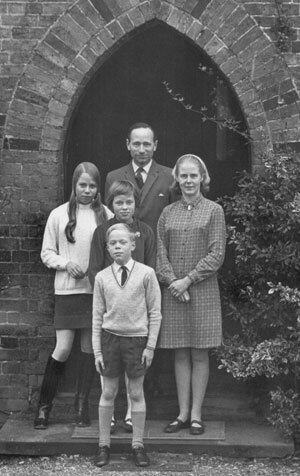 The parents of Rolf's father Henry Heudenfeld were Markus and Elise Heudenfeld. Markus, a 'handler of animal skins' and hat maker by trade, died in 1938 whilst his widow Elise at age 81 was deported in 1943 to Theresienstadt concentration camp in Czechoslovakia where she died (see below). 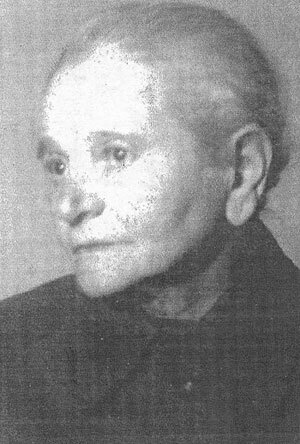 Elise Heudenfeld (age 79) 1940. The above picture of Elise Heudendfeld taken in 1940, 2 years after her husband Markus had passed away, is the only photographic image we have of Elise during the Holocaust period. The sadness in her face reflects her lonely predicament having lost her husband 2 years earlier and the persecution facing Jews in Germany. Elise's two older sons Siegmund and Max were deported to Minsk in 1941 (Siegmund and his wife Margarethe were shot on arrival but Max having witnessed their murder escaped) whilst her youngest son Henry (Rolf's father) fled to Spain with his second wife Martha Isaac. 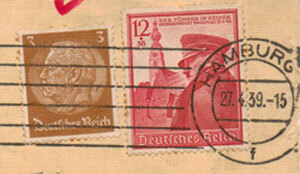 Martha died in Barcelona but Henry returned to Hamburg after the war. Elise was deported by the Gestapo on 24.2.1943 at the age of 81 from her home (a small one room flat) at No. 25 Rutschbahn Strasse in the Rotherbaum district of Hamburg to Theresienstadt concentration camp (on transport VI/3 from Hamburg to Terezin) where she died on 20.3.1943. 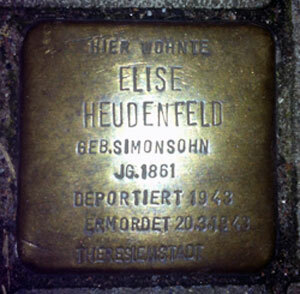 Stolperstein "Stumbling stone" for Elise Heudenfeld. There is a memorial 'Stolpersteine' (stumbling stone, a 10x10cm brass plaque - Stolpersteine Rutschbahn 25a - pictured above) outside the flat, later destroyed by Allied bombing, from where she had been deported. The flat was not her original home as she had been re-housed there from her home and most of her personal possessions confiscated by the Gestapo and their supporters at some point before then. Almost all Stolpersteine stones are laid by the German artist himself, Gunter Demnig. This link provides online information about Elise Heduenfeld's Solperstein: www.tracesofwar.com/sights/51437/Stumbling-Stones-Rutschbahn-25.htm. Henry had a successful exporting business in Hamburg. 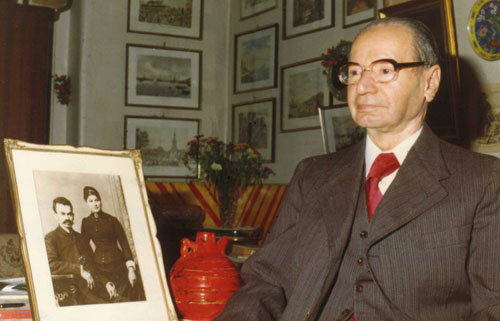 He escaped the holocaust with his second wife Martha Isaac to Spain on their way to USA but Martha died in Barcelona and he remained there until after the war when he returned to Hamburg where he became a clerk. with photograph of his parents Markus and Elise Heudenfeld. Pictured below on their wedding day in 1902 are Rolf's maternal grandparents, Karl and Lina Brinkman. They were both originally from Bad Salzuflen (between Hannover and Dortmund). Karl was a carpenter and Lina a dressmaker. Influenced by Lina's business acumen, they both established a furniture retailing business. They looked after and raised their grandson Rolf when his parents divorced in 1930. During World War II at great risk to themselves they hid their son-in-law's brother Max Heudenfeld in their Hamburg flat after he had escaped from Minsk Concentration Camp. 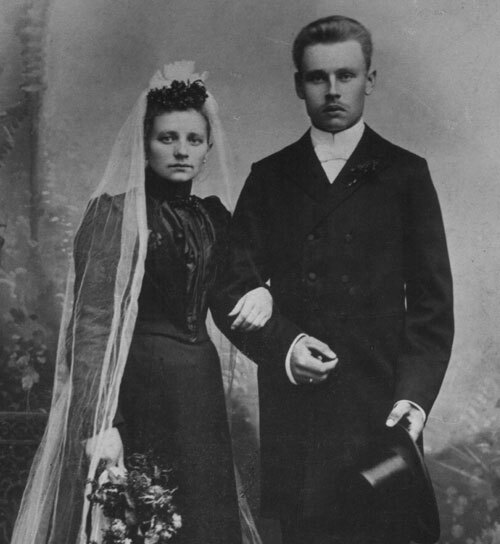 Lina and Karl Brinkmann on their wedding day in 1902. Lina is wearing black as her mother had recently died. 1. A printed copy of Phil Harding's biographical account of Rolf Harding's escape from Nazi Germany is also held by the Wiener Library (Institute of Contemporary History) in London. It is one of the world's leading and most extensive archives on the Holocaust and Nazi era. Formed in 1933, the Library's unique collection of over one million items includes published and unpublished works, press cuttings, photographs and eyewitness testimony. 2. The name Heudenfeld was derived from Heidenfeld, the family name used before the Heudenfeld's moved from Krakow to Hamburg. 3. 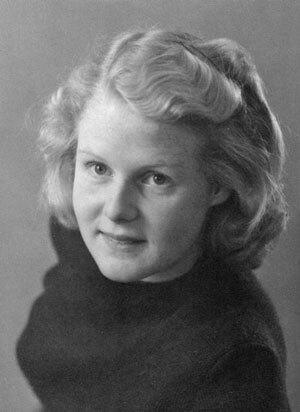 The family members killed by the Nazis were Rolf Heudenfeld/Harding's paternal grandmother Elise Heudenfeld (née Simonsohn) after her deportation from Hamburg aged 81 to Theresienstadt concentration camp, and her son Siegmund Heudenfeld and his wife Margarethe Heudenfeld (née Wolff) who were both shot on arrival at the ghetto in Minsk, Belarus. 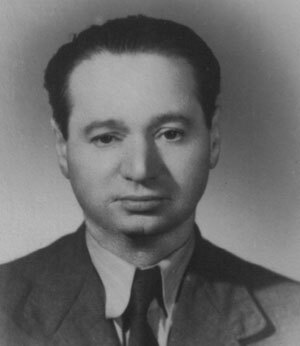 Their murder was witnessed by Siegmund's brother Max Heudenfeld who escaped but was subsequently re-captured and sent to Theresienstadt in February 1945 from where he was freed by the allies. ROLF: Bochner, Brinkmann / Brinkman, Butner, Cohen, Eggert, Heidenfeld / Heudenfeld, Himmelweit, Hirsch, Hochwald, Keh, Melzer, Schonberg, Simonsohn, Singer, Sobel, Somer, Taffet, Ulbrich, Wolff. 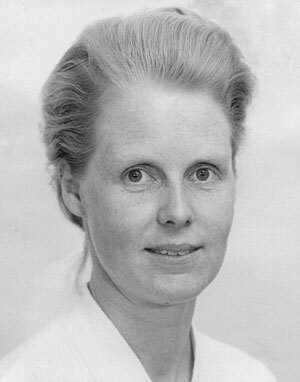 ELIZABETH: Armstrong, Ashton, Barber, Bartholomew, Beaumont, Benbow, Brinton, Chisolm, Christie, Clark, Clarke, Classey, Conner, Day, Elliott, Flynn, Fullstone, Friedel, Gellet, Greenbank, Grierson, Grout, Gunn, Ham, Hancock, Harding (original), Hardy (possible link to Sir Thomas Masterton Hardy of Lord Nelson's flagship "Victory" but as yet unproven), Hayward, Henshaw, Hopper, Horrex, King, Lang, Mack, Neville, Newby, Palmer, Parker, Peters, Pilbrow, Price, Pryor, Pynegar, Rice, Robinson, Ruff, Sill, Smith, Stone, Tilzey, Todd, Turner, Turnock. 5. 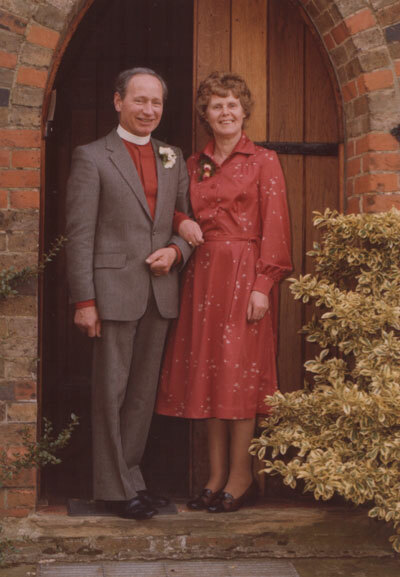 Rolf Harding was Vicar of Coopersale, near Epping, Essex from 1961-1991 living at Coopersale Vicarage. He was also Chaplain to St Margaret's Hospital, Epping during most of that period. 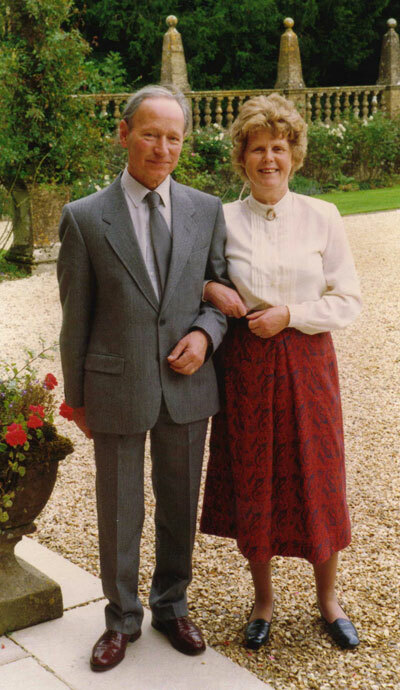 He and Elizabeth retired to Weston, Bath in autumn 1991. Rolf passed away at age 94 on 15th February 2017 after a long struggle with Alzheimer's; it is interesting to contemplate whether the trauma of his early life was a contributory factor in that cruel illness. tribute to Rolf Harding by Phil Harding. in Hamburg to Rolf in England. 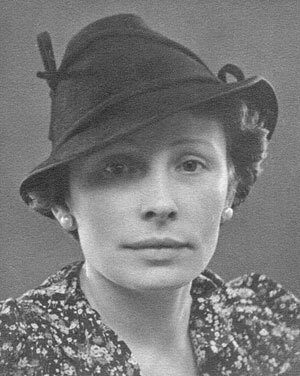 Rolf's mother, Luise Heudenfeld, c. 1929. Rolf's father, Henry Heudenfeld, 1950.
on their wedding day, Sept 1951. Rolf (38) & Elizabeth (31) Harding. James, 1986 at St Alban's, Coopersale. 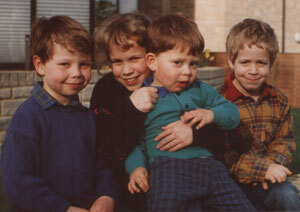 in 1994: Sam, Sarah, George & James.